House Intelligence Chairman Adam Schiff rejected Michael Cohen’s plea for help delaying and reducing his upcoming prison sentence. Schiff said he doesn’t get involved in sentencing matters as “a practice.” Adding, “I never have in Congress and that’s been my policy.” reported crime reporter Shimon Prokupecz. Schiff did say that he is still interested in getting as much information from Michael Cohen as possible. President Trump’s former lawyer-turned-rat Michael Cohen offered Democrats ‘more dirt’ last Thursday in an attempt to stay out of prison for a little bit longer or reduce his sentence. Cohen’s sewer-dwelling, Clinton-linked lawyer, Lanny Davis said in a statement that his client recently obtained a hard drive with 14 million files from his computers over the past 10 years. Michael Cohen was sentenced to 36 months in prison in December for lying to Congress, ‘violating campaign finance law’ (he didn’t) and crimes related to his taxi medallion business. Cohen was originally scheduled to report to prison on March 6th, and his incarceration was already pushed back to May 6th. 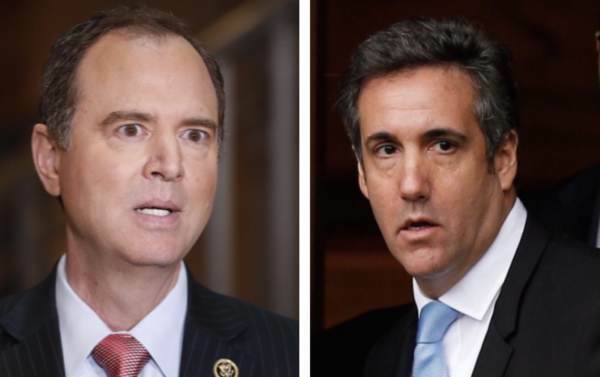 Schiff and the Dems are so desperate to smear Trump that they will take anything they can from a proven liar like Michael Cohen.